Priscilla Willis is the intrepid food and travel writer, eater, drinker, and picture taker at She’s Cookin‘. She travels far and wide immersing herself in the local culture through food tours, cooking classes, and exploring street food. 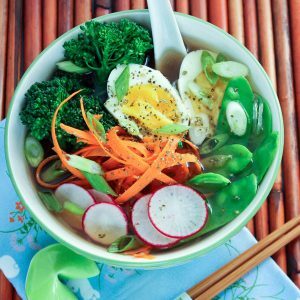 Her recipes focus on heart-healthy, low-sodium dishes using seasonal whole-food ingredients and a few cocktail creations because a happy life is all about balance. She lives at the beach in Orange County and also shares news and mouthwatering photos from area restaurants and food and wine events. You can also find Priscilla on Facebook, Twitter, and Pinterest. Kelp may very well be the next “It” food! Known as wakame, arame, kelp, hijiki, seaweed is a staple ingredient in Japanese cooking and is prized for its salty, umami character in the culinary world.